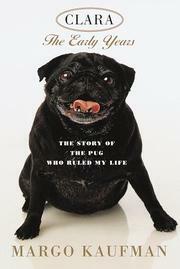 Pug stories—really a lot of pug stories, from sublime to ridiculous—by Kaufman (This Damn House, 1996). She’s the classic pet owner who is owned by her two pugs, Clara and Sophie. Kaufman considers herself to be the “Official Pug Lollipop,” an utter sap for canine manipulation. Sophie is truculent, “a fourteen-pound reincarnation of Mussolini”; Clara is uncontrollable, scheming, self-protective, watchful, and suspicious, not to mention (sometimes) fawning and sluttish. Kaufman coaxes as many laughs as she can from Clara’s antics (Sophie is too much the taskmaster for drollery and so plays second fiddle in the pug hierarchy). Some dominant themes: Clara dismisses Kaufman’s slavish attention and steals the limelight during her book tours. Thus, Kaufman consults a therapist (the coyly named Dr. Pangloss) to sort out her feelings of inferiority and indentured servitude. More authorial coyness: her canine ophthalmologist is called Dr. Blinkmeister. And more (there is far too much coyness here): —Clara loves Saks because all the gay shoe salesmen appreciate an adorable pug and there’s a pet boutique on the ground floor with Versace leashes and a four-hundred-dollar iron four-poster bed that she feels she deserves.— Halfway through the book, with the meat now sliced pretty thin on the dog-joke front, Kaufman shifts her attention away from Clara and tells the saga of adopting her son, Nicholas, from a Siberian orphanage in a bureaucratic process so byzantine and angst-ridden that it makes Clara’s misbehavior seem pedestrian. Then it’s back to Clara again and how she eventually comes to accept Nicholas, which is a lucky thing: Readers may ponder who would have been given walking papers if they hadn’t hit it off. Inevitably, the jokes get stale. Do you wonder why Kaufman doesn’t just trade the thankless beasts for a Lab and get on with her life?